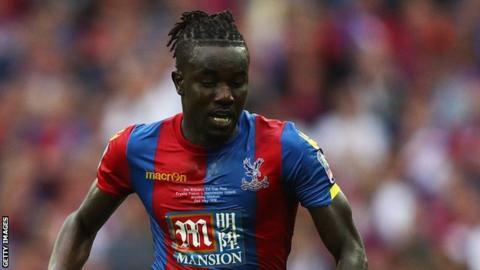 Crystal Palace defender Pape Souare was airlifted to hospital after a car crash on the M4 motorway in London - but his injuries are not life threatening. Souare, 26, injured his leg and jaw bone in Sunday's crash and will stay in hospital while he receives treatment. He was not part of the side that beat Middlesbrough 2-1 on Saturday. "The club are liaising closely with the hospital on his progress," Palace said in a statement. "Our thoughts are with Pape and his family at this time." Palace manager Alan Pardew said Souare may have broken his leg and could face a lengthy spell on the sidelines. "He's not in a good way in terms of football," Pardew told Sky Sports. "Thankfully he looks sound other than that, just a bit bashed up. "We'll have to look after him and get him back as quick as we can because he's a great lad and it's a big loss. It is a blow but these things happen." The Senegal full-back, who joined Premier League side Palace from French club Lille in January 2015, last played for Palace in the 1-1 draw with Bournemouth at Selhurst Park on 27 August. Palace team-mate Yohan Cabaye tweeted his support for Souare, writing: "Be strong! I wish you a very good recovery."